During my studies at SIUE, I was introduced to innovative technologies that are designed to address urban environmental problems. Green roofs, blue roofs, green walls, rain gardens, bioswales, etc. can help mitigate stormwater runoff and/or the Urban Heat Island Effect (UHIE). I conducted my thesis project on a specific kind of green wall, a green retaining wall. A green retaining wall (or some variant of living landscape wall or green landscaping wall) is designed to stabilize a slope and create space for development just like a conventional retaining wall. The difference is that these retaining walls are plantable. Remember the eyesore of a towering retaining wall at the edge of a parking lot? How about the monotonous wall in a hilly yard? Well, plantable retaining walls give us the opportunity to beautify urban space without compromising function. In addition, they can provide environmental benefits like stormwater management, temperature moderation, noise reduction, and biodiversity improvements. 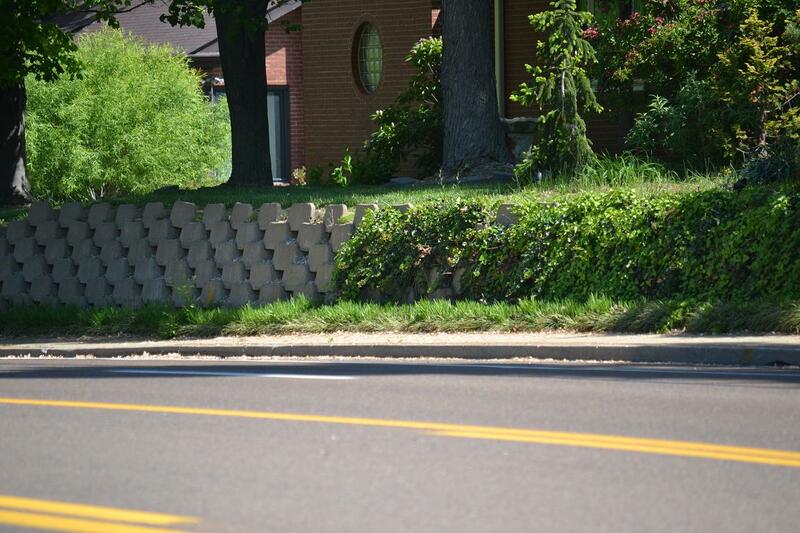 These retaining walls have been employed all over the country, including the St. Louis area. Although, not all of the walls have been planted. While the blocks themselves offer great texture compared to a traditional retaining wall, not seeing them for the greenery is ideal. Hmm….if anyone happens to see these walls left unplanted, consider some guerrilla gardening. Just kidding…maybe. 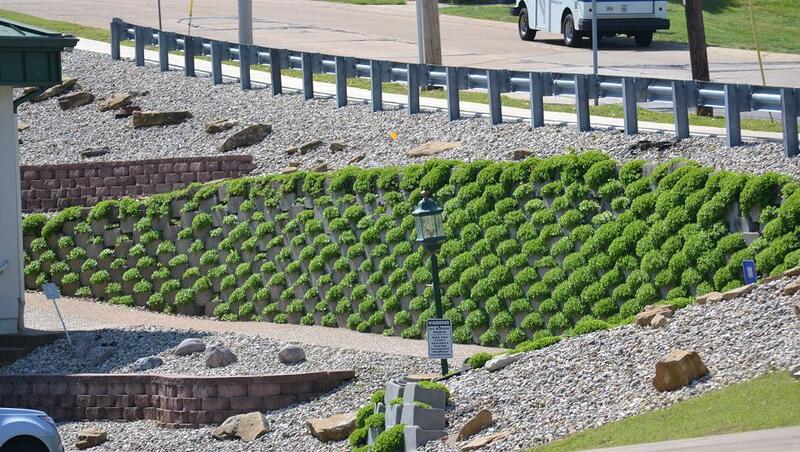 And maybe learn about living retaining walls through a new St. Louis-based company, The Living Wall Company. This entry was posted in Sustainability and tagged environment, green, green infrastructure, green wall, living wall, retaining wall, St. Louis, stormwater, sustainability, urban heat island, urbanization, vertical garden. Bookmark the permalink. Thanks for dropping by! I don’t remember where I heard that term, but I like it too. Today I bought some Coneflower seeds to sow where they’re needed…a yard, a garden, a field. Cone flowers? What are they? and have you an explanation for my white bluebell (please)?